The erstwhile President of the Fako Chief Conference travelled to the world beyond at about 05:00am on the 19th of February 2018. Being a man of the people, the community was always concerned anytime they got rumours of his demise. The Royal Father who had been seriously sick since 2013 had attracted a lot of attention within and out of his community due to his outspoken nature. He was an activist who decried discrimination and always made efforts to improve the life-style of his colleagues and members of his community. His commitment to the welfare of others earned him, winner of the Guardian Post 2009 Achievement Award for Outstanding Accomplishment as Traditional Ruler https://www.fakonewscentre.com/chiefdavidmolinge.htm. Being a hospitable traditional leader also earned him an international award on October 2010 https://www.fakonewscentre.com/nigeriahonoursmolinge.htm. These are just a few among other awards he gained while alive. Chief Molinge will be remembered for fighting alongside the Bakweri Land claims Committee for the restoration of the indigenous land by the Cameroon Development Corporation (CDC) which has led to the expansion of many villages in Fako Division. Many listeners of the radio show programme, Global Voices on CRTV Buea, are already missing his participation in this radio show where he often took side to sensitise for the plight of women and the less privileged. In addition to being a traditional ruler, the Royal Father, Chief Molinge was a business magnet with a chain of businesses. He was the founder and CEO of the famous King David Square Hotel in Muea amongst other businesses. According to the biography presented by his family, Chief David Molinge was born on February 1, 1949 in Upper Muea-Buea, to Chief Francis Molinge Mo-Ngole and Martha Ma-Nganje all of blessed memory. He was the last and only survivor of many siblings. He obtained a Diploma in Salesmanship through Rapid Result College of London just upon finishing Standard Six. He then gained employment to teach as a probationary teacher with the Cameroon Baptist Convention. He later joined Guinness Cameroon SA where he served as Cashier, Marketing and Regional Sales Supervisor from 1975-1992. He also served as Marketing Development Manager for the now defunct Milkco Cameroon before moving to full time Businessman. 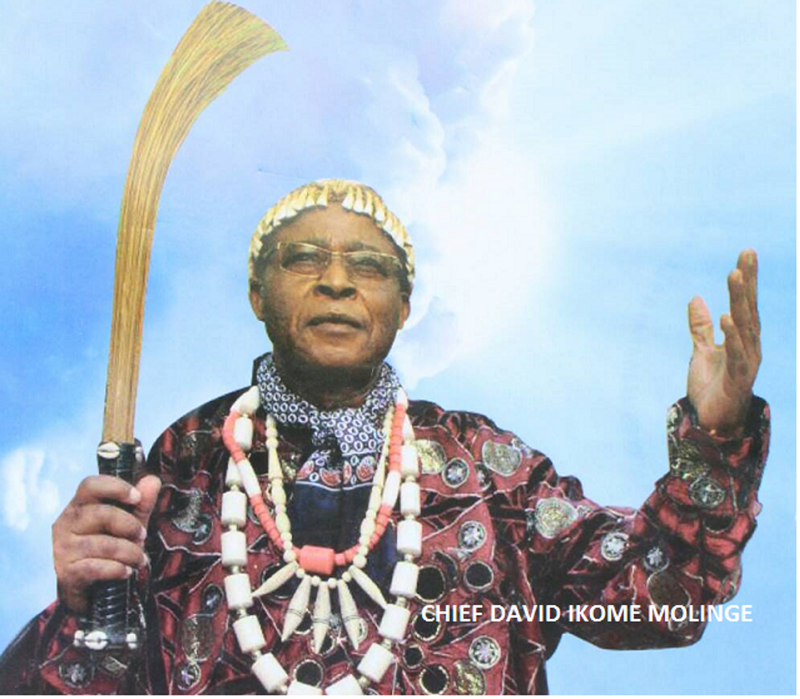 Chief Molinge was enthroned as traditional leader of the Second Class Chiefdom of Muea on March 5, 1994. He occupied different positions as a traditional ruler during his reign. First, he was Vice President of South West Chief’s Conference (2005-2007), President of Fako Chief’s Conference (2008-2010) and Assistant Organising Secretory of the National Conference of Cameroon Traditional Rulers, a position he held from 2010 till his death. In addition to his activities as traditional ruler, he also was appointed as special Civil Status Registrar of the Muea Court Area in 1994. He was also a Municipal Councillor of the Buea Council until his death.